Sketches from the Big Muddy! Optics hate it, clothes hates it, even skin hates it but birds love it. Mud, Glorious Mud! What on earth am I talking about you may ask? Let me explain. As I mentioned in my last blog post I was heading up to Clontarf castle for the INREDA Xmas fair. Well the following day I decided to head off to the Bull Island Reserve to sketch and photograph its feathered residents and migrants. The day was dull and light bad and so the photography side of things didn’t overly excite me but I spent some valuable time sketching and painting wildlfowl. 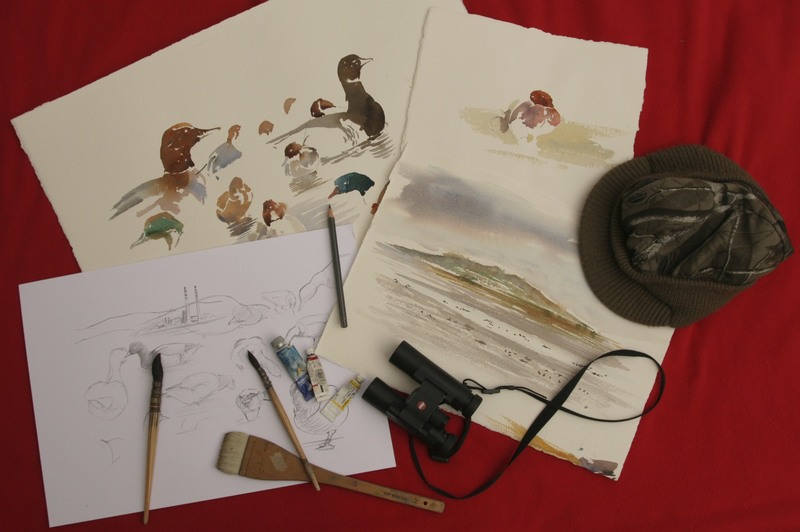 This is an important discipline of being a wildlife artist and the opportunities at Bull Island are superb. Where would I begin? There were rafts of wigeon and pintail, parties of teal, shoveler and mallard .There were curlew, godwits, dunlin, turnstones, greenshank, redshank, sanderling, and knot. Herons and egrets were stalking the shorelines and the incessant soft calling of the large numbers of brent geese made for a beautiful chorus of birdsong. The incoming tide was slowly pushing all these critters towards me but by the time they were really close and would make great photographic closeups the light was gone! I have included a few of my snaps at the end of the blog. I left the reserve at twilight and drove the long journey home to Connemara tired but well pleased. Oh and by the way the Christmas fair was an excellent one with top quality vendors. I do hope they run it again next year.